Travelling to London from the North East in the middle of a Tube strike may not seem like the most sensible idea in the world, but it was worth it for the Destinations travel show, which ran from February 6th to 9th. My journey from King's Cross to Earl's Court involved waiting 45 minutes at Victoria for a very packed Tube and being spewed out at an unexpected station, due to mine being closed, but I still managed to make it on time. Thursday February 6th started well with a press breakfast hosted by No 1 Traveller, which has airport lounges at Heathrow, Gatwick and Manchester, among others. As well as complimentary bucks fizz, pain au chocolat and a relaxing massage, this also gave me the chance to chat to some fellow travel journalists. 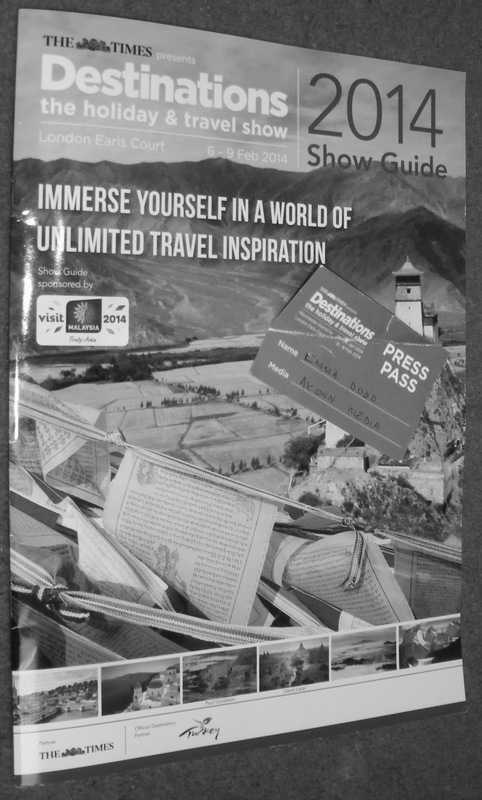 The show itself was a useful opportunity to meander among the stands and soak in all things travel-related. I stopped by the Malaysia tourism stand to get inspiration for my upcoming trip in March and chatted about the possibilities for trekking to hill stations on a jaunt from Kuala Lumpur. An impressive array of photographs were also on display for the Wanderlust Travel Photographer of the Year award. It is amazing to see the incredible skill with which people can capture the world around us. 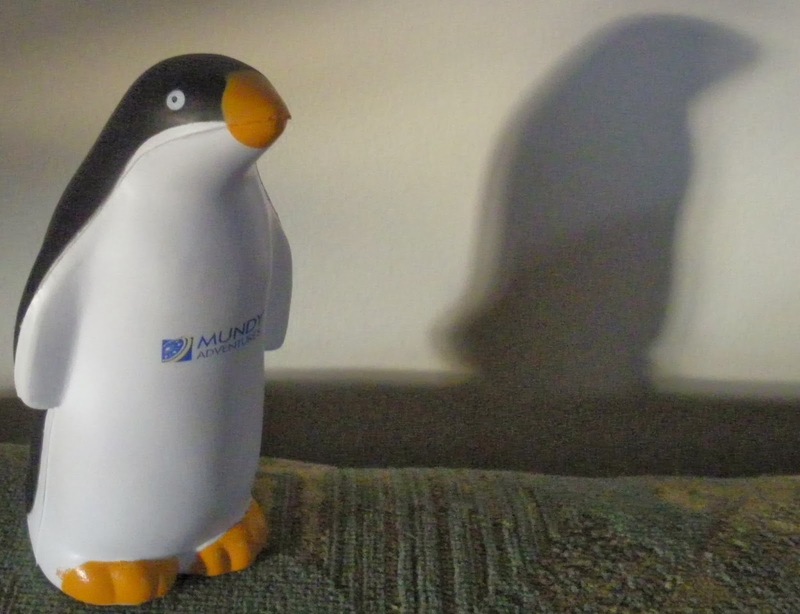 While the stands are nice to wander around and it is great to get freebies, such as Mundy the penguin, the real draw of the show is the lectures given by specialists in their respective fields. It is these sessions that really fire the imagination and get you thinking about all the destinations yet to explore. The definite highlight of this year's event was listening to Simon Reeve live in conversation with Paul Goldstein of Exodus. The TV presenter and author has an impressive back catalogue of experience and programmes that have taken him across the globe. So popular was this event that people crowded into the area, standing and sitting on the floor to hear what he had to say. He spoke every day at the show, but the great thing about formatting such an appearance as an interview means each time will have been different. Questions from the audience also helped to move the conversation in new directions, keeping it interesting for him as much as anyone else. It is not surprising that proceedings began by talking about Reeve's most recent project, entitled Pilgrimage, in which he visited some of the most important religious sites in the world. He confessed that his favourite part of filming the series was arriving at Santiago de Compostela, which marks the end of the famous Camino route through Spain. Reeve also spoke of the fact that Jerusalem is much smaller than you would imagine for a place of such huge significance for people all over the world. He joked about those who know him poking fun at the overuse of words such as 'amazing' during his programmes, but highlighted the importance of presenters just saying 'wow' and allowing the cameraman to span out and take in the beauty of the place, as this is what the viewers really want to see. Another area that Reeve spoke about during the session was the protection he feels when filming due to a highly competent team surrounding him. This is something that it is important not to become complacent about, as he went on to explain. On an occasion when he was filming with a scientist who collects the venom from box jellyfish in Australia, there was another danger present - crocodiles. An expert was on hand to ensure that the creatures did not get too close, but nobody should stay in the water too long, as the crocodiles become aware of their presence and start to circle. Reeve was intent on getting the shots with the scientist when the expert said he should get out of the water. The presenter protested and said he just wanted to get a bit more footage. He was manhandled by the crocodile watcher and pushed to safety, at which point Reeve was reminded of the fact that "the crocs don't know we're from the BBC" - a vital thing to remember. Another fascinating series that Reeve presented was called the Places That Don't Exist, which explored nations that are not recognised by the UN. These include Somaliland and Transnistria, which lies on the border between Moldova and the Ukraine. His comments about this unofficial country really sparked my interest, especially as I had not seen the series myself. On returning home I looked further into Transnestria and popped what I found on Twitter, putting both Reeve and one of my colleagues into the tweet. 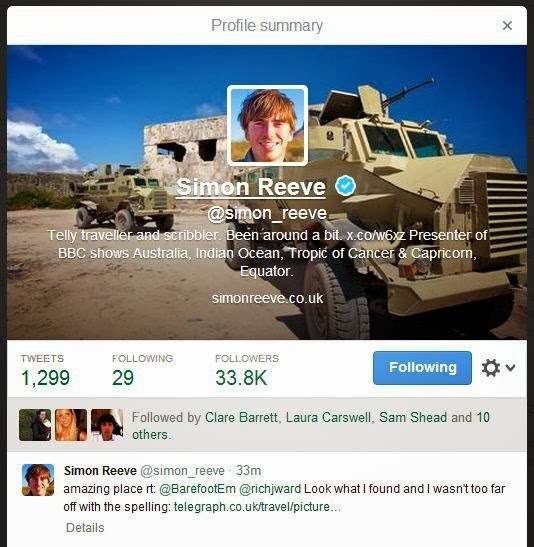 To my great surprise, Reeve retweeted me with a little reply, which made my week. Safe to say, all the retweets and favourites made the post the most well publicised I have ever had! Fans of Reeve's work will be interested to know that his next project is to be on sacred rivers. Another fascinating subject, I'm sure you will agree and one that has already taken him to the Ganges and will see him visit other waterways, such as the Nile. I went on to attend talks about the Galapagos by Richard Furlong of Furlongs Travel and Namibia by Wilderness Safaris. Both were inspirational and made me want to grab my passport and set off right away. The Galapagos is somewhere that has been on my wish list for a long time, although that is where it may stay for a while, looking at the prices. Namibia is one of the destinations that I was lucky enough to visit as a child with my family. The images of Fish River Canyon and the Namib desert brought back so many memories. As the representative said: "Go to Namibia and if you have already been, go again." Sounds like a good idea to me.